From Cott Lang's Webpage: "I've worked on Renegade on and off for 6 years. On April 23, 1997, I turned it over to Patrick Spence. It's a freeware package that I keep working on because I wanted something I could modify, I wanted something I knew was backdoor free, and because I think all the commercial packages are crap... Those that want support for Renegade throw a few bucks at Patrick's BBS to help him out." 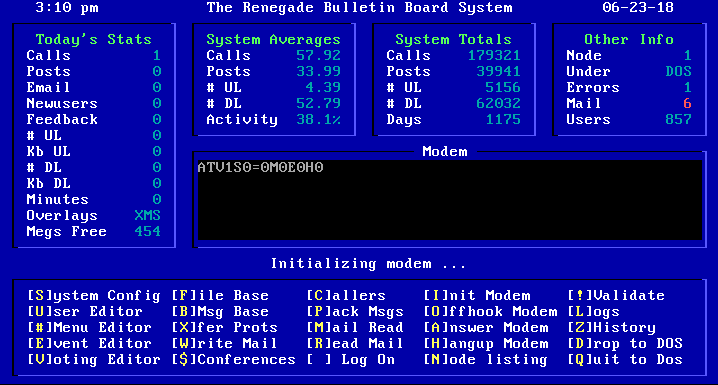 From Ariven's Webpage: ""Renegade BBS is a dos based dial communication system (BBS) that includes message areas, interactive chat, file downloads and a sense of community, originally created from the Telegard 2.5 source code by Cott Lang. After Cott Lang stopped working on Renegade, he passed it on to me to work on. Soon I became very familiar with some of the reasons that caused him to make his decision to cease working on Renegade. Renegade is currently in the hands of Corey Snow, who is working on a project to spawn Renegade as a rewrite into an open source project. It looks promising, and has my full support." I was contacted by Chris Hoppman and T.J. McMillen and told that they are also developing a version of the Renegade software. Their website is the current listed one for the software. Note from Jason Scott: For a number of years while I worked on the BBS documentary, I came into contact with a good number of the developers for Renegade software. To say there's some miscommunication between different parties is an understatement. Part of the problem (if it can be called that) is that first of all, Renegade was a popular BBS program, meaning there was significant worth and value placed on feature development and work, meaning more pressure for whoever announced they were working on it. Second, the software's source code has been tightly controlled since its creation, meaning that only authorized parties could develop it. This meant a small web of trust, and also meant that if whoever was developing the software wasn't doing so to the satisfaction of the large (non-paying) audience, they recieved an awful lot of grief. Finally, Windows' acceptance and dominance of the x86 platform meant that Renegade's development was stalled at several critical junctures. As mentioned above, work has continued, but there are a lot of broken hearts and bad feelings left behind with this program. Update for November 2009: Contacted by T.J. McMillen; he says Lee Palmer and himself are working on the Renegade software, and that Chris Hoppman stepped down from the project in 2004, and that 99% of the source code has been rewritten since the 2003 handoff from Patrick Spence. http://www.renegadebbs.net is no longer the official homepage. rnm100.zip (128K) Windows Renegade Node Monitor tool - written in Borland Delphi as I toyed with a Win32 port.